The dramatic flip-flop by Jerome Powell over the past month, when the former lawyer and PE partner mutated from a bubble-busting hawk to a BTFDove in response to the market's reaction to the Fed's "autopilot" comment on the Fed's balance sheet, was not the first time the Fed chair radically reassessed his monetary policy view in response to the market. He also did so back in 2013, before and after the Fed's bond tapering announcement, when the US central bank first hinted it would start reducing its bond purchases as it sought to normalize its balance sheet, and which culminated with the infamous Taper Tantrum of 2013 when bond yields spiked and stocks tumbled over fears the Fed was removing the market's training wheels. As a reminder, during a May 22, 2013 congressional hearing, Ben Bernanke for the first time discussed an end to the bond purchases which sparked the "taper tantrum," sending up bond yields and sparking an outflow of money from emerging markets. ... we have closed off all the off-ramps except one, and we could be sitting here in a year having this conversation trapped by market expectations. The case for tapering would be that since the program was initiated in September, we’ve achieved substantial progress toward our economic objectives in the form of lower unemployment and higher payrolls." As a result, Powell said that "we ought to take the next plausible opportunity reduce the pace of purchases, and I hope that time will come in June"
... although he did leave himself an economic, but not market-dependent, loophole, saying that "if the data are bad in June and it’s not plausible to taper, I will support tapering at the next reasonable opportunity. If the data are really terrible, I’m also open to increasing purchases." As a practical matter, let me say that, in my view, it’s never going to be a good idea to surprise the market by a surprise tapering or to say that the tools have stopped working... This can be managed. This is not an unmanageable thing in the context of reasonable economic data. We showed, after the last meeting, that this is something that can be done. This is not going to be done in a way that provokes a massive reaction of shock from the market. 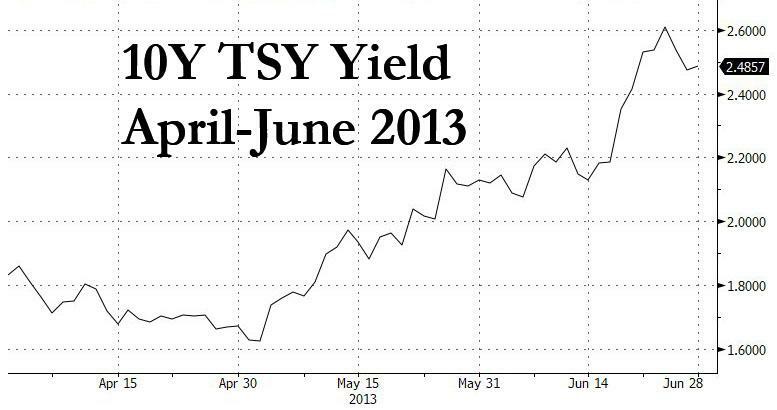 Well, oops, because for those who are too young to remember, what happened next is that... the market was shocked, and the 10Y yield soared 100 bps from the start of May 2013 to late June 2013 as traders freaked out that without the Fed there to backstop TSYs, prices would tumble. My conversations with investors carry a clear message that we have all heard, which is that the market does not understand when we will reduce purchases or why. And that has got to be one reason why the financial market reaction in fixed-income markets here and around the world has been stronger than I would have expected. This is a dangerous state of affairs, and I see the main purpose of this meeting, and the Chairman’s press conference, as addressing that. Ironically, Powell once again knew what was going on - namely that the market simply can not operate without the Fed's "visible hand" propping it up, and certainly not infinitely, but when the market panicks, as it did in the summer of 2013... and as it did in December, there was nothing Powell, first as Fed governor and then as Fed chair, could do besides offer some more Kool-aid to the market. In a sense, as some have argued, the increase in rates has been healthy, as investors are becoming aware that low rates are not going to last forever and are taking appropriate measures. But it will not be healthy or warranted if, for example, the 10-year rate backs up another 50 basis points, or if investors move the liftoff date or, for that matter, if investors conclude that serious consideration of reducing purchases is postponed indefinitely. So it will be very important to leave the markets feeling much more certain about the Committee’s intentions. I'm not concerned about a little bit of volatility, but I have to say I am concerned that there may be more than that here. It’s very, very hard to know, I have to say. The more time I’ve spent with markets, the less I believe in my own ability to predict them, and I think that’s largely because when you talk to the people who actually matter for this, they always talk their book. It’s just the way it is. The people who are willing to talk to you are not the ones who really matter, unfortunately, and that’s just the way it is. Powell's parting recommendation: "it’s important that the Committee, by which I really mean the Chairman, assert strong leadership to the markets on this issue at this time." Bernanke did just that and the Fed ultimately waited until December to taper the purchases, due to the market's initial tantrum to the Fed's announcement. In the end, the market realized that tapering was inevitable and resumed purchases of bonds and stabilized. Which begs a question: having observed one such market shock in response to a Fed statement, which however did nothing to alter the Fed's plans to eventually not only taper but also ultimately shrink its balance sheet, will Powell do the same this time, and having observed the initial "freak out" in the market last December, will the FOMC chair continue shrinking the Fed's balance sheet, ignoring the market's "shock", or as so many have suggested, will Powell now be forever "trapped by market expectations" having tipped his hand that the "Powell Put" is just above S&P 2,300, and cave every single time traders decide to "take the market hostage" and demand concessions from the Fed by hammering stocks lower, especially with Trump breathing down his back. ... as Charlie Evans referenced the paper yesterday and as the paper argues, we do have a pretty well-stocked cabinet. We still have excess reserves of $1.52 trillion as of the statement of January 23—that’s 92.9 percent of reserves—and a monetary base at $2.7 trillion. So I think Koenig and Atkinson are right. We’ve installed a liquor cabinet in the Fed’s rec room. It’s fully stocked with an assortment of booze. I want it clearly understood that I am not advocating going cold turkey—so, basically, no migration—to use and kill the liquor cabinet image—from Wild Turkey to cold turkey. We might take credit for the perceived improvement in the economy, but nearly all of the money that we’ve created remains in the form of excess reserves. It isn’t circulating through the economy. What we have done, basically, is to provide a monetary head fake. I discussed views with some 25 market veterans in New York, and you’re going to be coming down as our guest to discuss with some of the local Texas market operators. I would say one consensus, and one only, emerged, and that is that quantitative easing is unambiguously inflating asset prices and, according to some, is distorting financial market functionality. As one said, artificially low interest rates invite fiscal sin. Good luck with that normalization.